Perfect water slide for backyard fun. 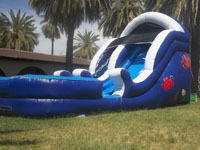 Sets up in a smaller area but with all the fun of a bigger slide too! Front loading requires less space. Kids slide into a splash pool landing.